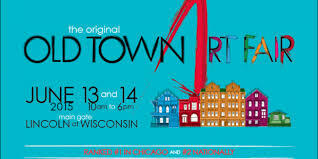 The Old Town Art Fair, one of the top art fairs in the country, celebrates its 66th year on June 13 and 14, 2015 as the charming, tree-lined streets of the city’s historic Old Town Triangle District set the stage for 250 nationally acclaimed artists and an estimated 50,000 art lovers. Oconomowoc resident, Tom Dumke, is one of the 250 artists selected to exhibit and sell one-of-a-kind, handcrafted work at the “Old Town Art Fair”, which will be nearly one mile of arts, the Festival is held annually in the streets of Old Town Triangle District – a charming community within the city of Chicago. On June 13 and 14, 2015, the gates will be open Saturday and Sunday 10am-6pm, rain or shine. The main gate of the Old Town Art Fair is located at Lincoln Avenue & Wisconsin Street. Other gates: Lincoln Park West & Wisconsin; Sedgwick & Menomonee: Sedgwick & Wisconsin; Menomonee & Wells; and North Park & Willow. A donation of $7.00 per adult is requested; children 12 and under are admitted without donation. For more information about Old Town Art Fair, click here.